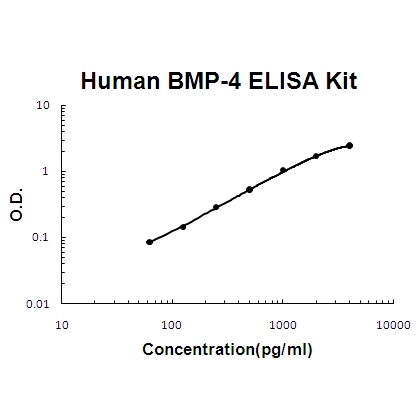 Sandwich High Sensitivity ELISA kit for Quantitative Detection of Human BMP-4. 96wells/kit, with removable strips. bone tissue and cell culture supernates.. Induces cartilage and bone formation. Also act in mesoderm induction, tooth development, limb formation and fracture repair. Acts in concert with PTHLH/PTHRP to stimulate ductal outgrowth during embryonic mammary development and to inhibit hair follicle induction (By similarity). . Bone morphogenetic protein 4 is a protein that in humans is encoded by the BMP4 gene which is located to 14q22-q23.1, The protein encoded by this gene is a member of the bone morphogenetic protein family which is part of the transforming growth factor-beta superfamily. BMP4 is a polypeptide belonging to the TGF-beta superfamily of proteins. It, like other bone morphogenetic proteins, is involved in bone and cartilage development, specifically tooth and limb development and fracture repair. It has been shown to be involved in muscle development, bone mineralization, and uteric bud development. BMP4 has also been implicated in Fibrodysplasia Ossificans Progressiva in which it is underexpressed. In human embryonic development, BMP4 is a critical signaling molecule required for the early differentiation of the embryo and establishing of a dorsal-ventral axis. BMP4 is secreted from the dorsal portion of the notochord, and it acts in concert with sonic hedgehog(released from the ventral portion of the notochord) to establish a dorsal-ventral axis for the differentiation of later structures. BMP4 stimulates differentiation of overlying ectodermal tissue. Inhibition of the BMP4 signal(by chordin, noggin, or follistatin) causes the ectoderm to differentiate into the neural plate. The standard product used in this kit is recombinant BMP-4 with the molecular mass of 26KDa.